This arrow point was found during the excavation of mound 72 in one of three caches that all together contained about 1200 projectile points. There were only about thirteen points in Mound 72 that were similar to this example. 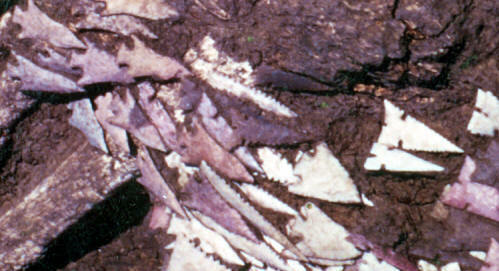 It was discovered within a much larger cache that contained several different styles of points. All the points in this cache were laying parallel to each other and generally facing one direction suggesting they were once hafted onto arrow shafts. This point represents one of the artistic styles that are unique to Mound 72. It's corner notched like both the Agee and Agee A type points, it also has recurved blade edges that are similar to some Agee points and it has the straight base like Agee A points. The style of this Mound 72 point seems to be influenced by Caddoan arrow point styles from the Arkansas and Oklahoma areas located southwest of the Cahokia Mounds site. 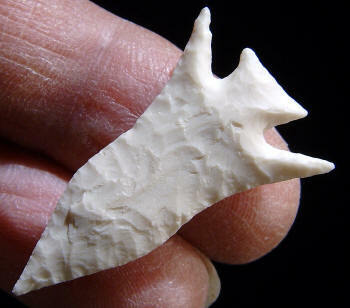 This point is made of white Burlington chert and it measures 1 3/8 inches (3.5 cm) long.